The deadly worlds of the Cryptus System, always beset by the gravitational and radioactive forces of their twin stars, have come under a new threat – the xenos might of the tyranids. A tendril of Hive Fleet Leviathan has reached the Cryptus shieldworlds. The Imperium musters its strength, for the aliens must be stopped here, as next in the hive fleet’s path is the home world of the Blood Angels Space Marines, Baal itself. 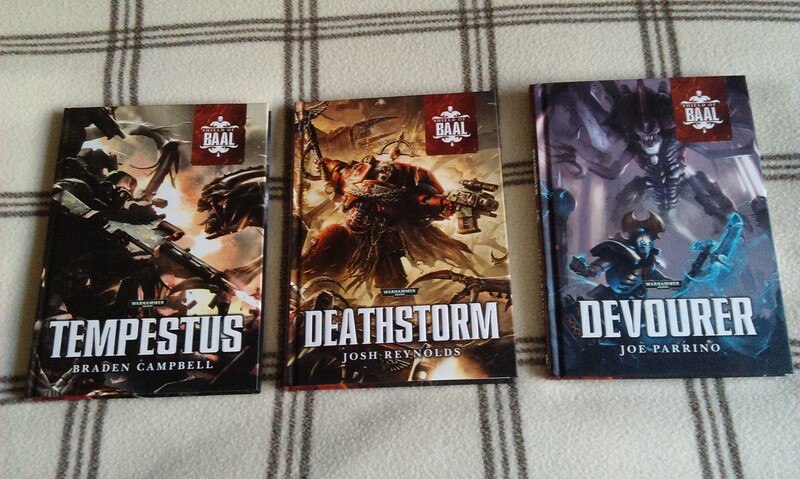 That’s right, folks – time for a review of the Shield of Baal series of novellas and e-books from Black Library! 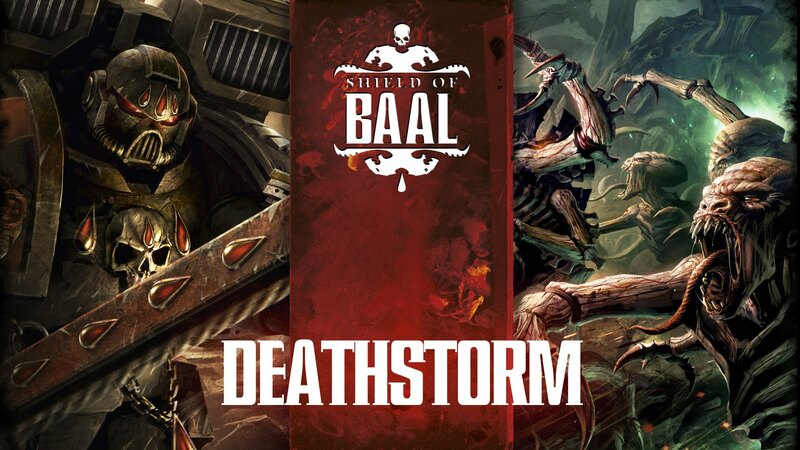 These stories support the recent Shield of Baal campaign from Games Workshop that has helped to publicize the recent releases of Tyranid and Blood Angel models, which culminated in the Deathstorm box set. I don’t play Warhammer 40k, of course, but I do enjoy the setting, and part of that enjoyment has come from this series! 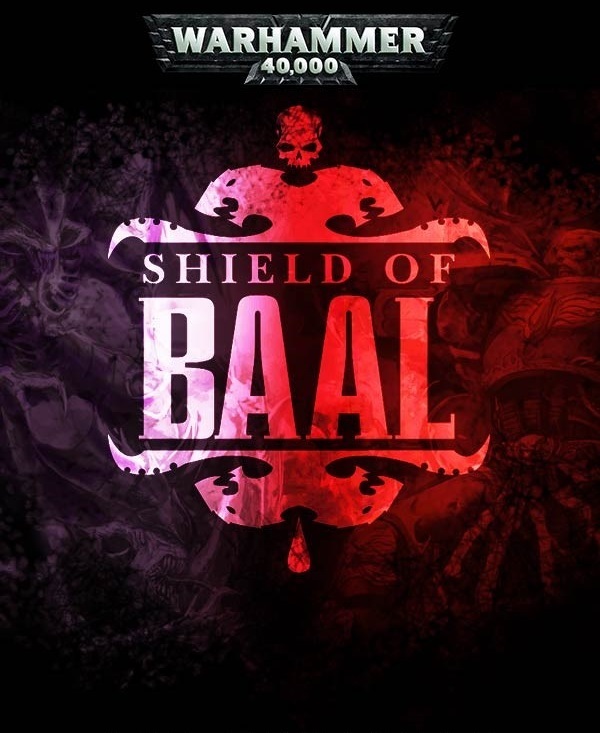 Shield of Baal began back in November, with the publication of the campaign supplement Leviathan. 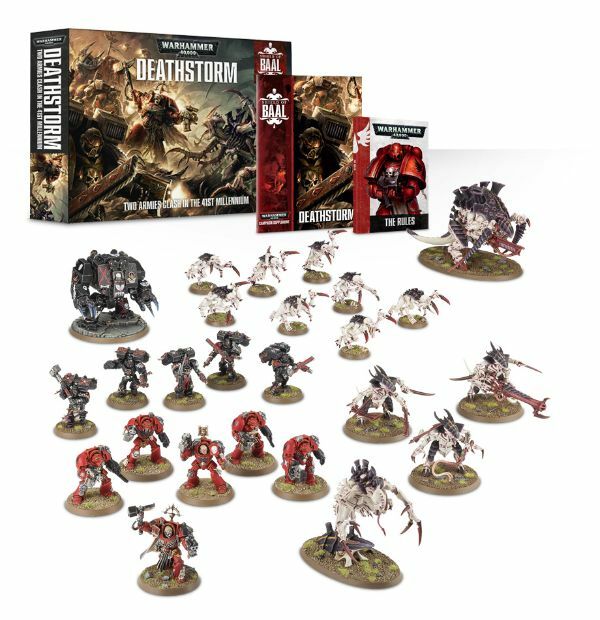 Selling out within the first hour of being available for pre-order, it was either this or the Khaine supplement for Warhammer Fantasy’s End Times series that appears to have prompted GW into re-releasing these things in paperback. 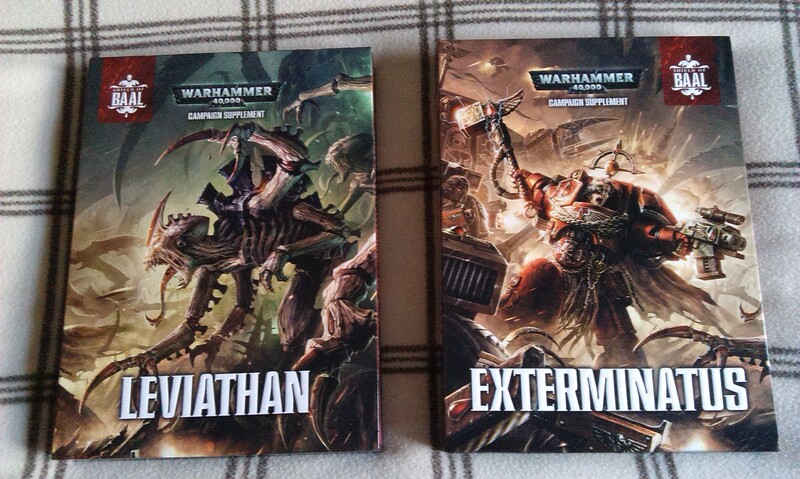 Anyhow, Leviathan was the first of two hardback supplements, the other being Exterminatus, both of which framed the box set release itself. These books have some absolutely gorgeous art – for more on that, check out my tumblr posts here and here! The slipcase for each features two books, of course – the fluff and the crunch. The latter provides all of the rules for the models, including those for the new Tyranid releases that began in October/November. Anyhow! These three novellas form what I suppose is the overarching storyline of the campaign, and function very much like the End Times novels we’ve been seeing in Fantasy. The fluff books in the campaign supplement releases can be seen as the history books of the time, so we see virtually everything that occurred, while the novels/novellas dramatise the story much like a historical film might present the events. 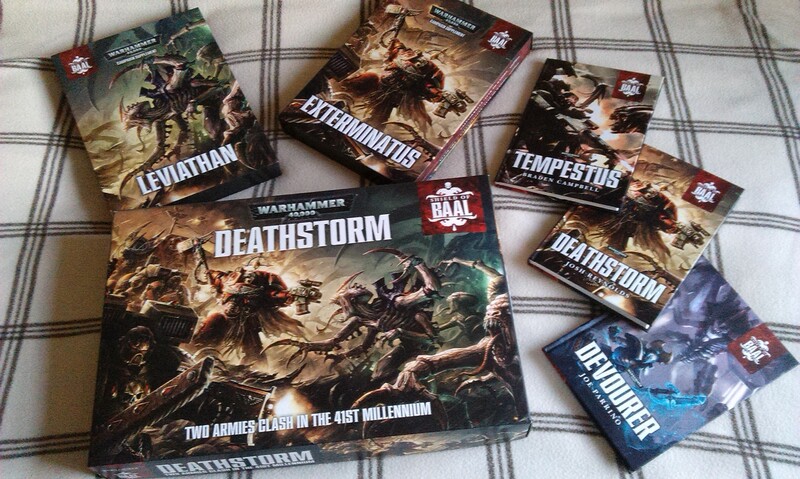 #Deathstorm #Warhammer – the next novella! The next short story is a bit longer, and coincides with the box set itself. Deathstorm begins as the Tyranid invasion is getting under way, and introduces the Blood Angels First Company, under the command of Captain Karlaen – the Shield of Baal himself. Karlaen is tasked with retrieving the Governor of Phodia, whose bloodline might hold the key to curing the Blood Angel’s Red Thirst. The story follows Karlaen and his men as they follow the trail of the governor, who holed himself up in a private bunker shortly after the Tyranids arrived. I enjoyed this one immensely! I was particularly impressed by the way Reynolds writes the Brood Lord as a point-of-view character, given the fact my previous encounters with 40k novels have had the xenos just as the antagonists. The twist at the end is also amazing, and actually really well-written (I think!) The other thing I really liked was the way all of the major players in the meat of the story (excepting the governor) are models from the Deathstorm box set – for me, this just goes to show the power of thematic, scenario play, where you can take a collection of models and spin an entertaining story out of them! From there, we then have a couple of e-books, starting with Wraithflight. This brings the Eldar into the storyline, though quite gratuitously, in my opinion. Nothing seems to be added to the overall tale, it’s very much a sideline to the main event. If you’re an Eldar fan, it might be worth downloading – it also follows on from a previous novel, so you might like to read it if you’ve read Valedor, also. But to me, it didn’t really contribute anything. The third and final novella (it seems), Devourer was released with Exterminatus, and was just far too exciting for my Necron-love, as it has Anrakyr the Traveller on the cover! Oh yes, this one promised to be excellent! Unfortunately, that promise didn’t quite hold true, in the end. Anrakyr is trying to awaken a tomb world amid the Tyranid invasion, without realising the world is already awakening. We follow the reactivation through the eyes of a Cryptek and her Lychguard, as she discovers the Flayer virus has crippled the Lords and Overlords – and the Phaeron herself! Unfortunately, the Tyranids prove to be too much, and Anrakyr is forced to flee the world, no great loss when he realises the extent of the virus. I really wanted to like this story, given how the Necrons are centre-stage for it, but it sadly fell a bit flat for me. I really don’t mean to sound sexist when I say this, but I was surprised at how many female Necrons there are – I’d always just thought they were beyond such things as gender-recognition post-transformation, and all. The fact that we get inside Necron heads also seemed to destroy the mystique a little too much for me – ironic, given the fact that I’ve wanted to read a story with them for so long! However, my main issue is the fact that the story just doesn’t seem to go anywhere, and has such an inconclusive ending. Not to be too harsh, but the actual storyline is one I think that should be more suited to an e-book – Anrakyr tries to wake a tomb world, and finds them all infected with the Flayer virus, so flees the surface for the next one. The novella would be better-served with more of a conclusive ending, when he finds a tomb world and it’s all set and ready to smash the Tyranids! There’s a side-story of Blood Angels guarding the dead planet Perdita, but following a Tyranid sortie they crash on the surface and have to fight their way through the caverns, latterly with the assistance of the Necrons. I feel that the story in Devourer is setting up something else, though as it’s (ostensibly) the last in the series, it appears to go nowhere… However, it’s not all bad – what we do get is a nice look into the reactivation of a tomb world, some excellent scenes that sent a little shiver of goodness over me as I read descriptions of my favourite army, including the Tomb Sentinel of all things! And there are some pretty awesome set-piece battle sequences to enjoy! There is a third e-book worth downloading, called Shadow of the Leviathan, which features the Ultramarines in a different sector of space. The story centres around the Chief Librarian Tigurius and his struggles with a new psyker Tyranid monstrosity – never identified by name in-story, it’s not difficult to see it as the new Maleceptor model that was part of the wave of releases in November. It’s actually a nice little story, and definitely worth checking out if you’ve enjoyed any of the other tales in the Shield of Baal series! These stories are lots of fun, for a variety of reasons, with Deathstorm by far being the best of the lot. There are some excellent battle descriptions, possibly my absolute favourite being Tigurius’ aristeia in Shadow of the Leviathan. And, of course, it’s always fun to have stories where you can imagine the goings-on through models on the tabletop! Being a campaign supplement for the wargame, I suppose there is necessarily an open-ended feel, as people will be playing through these scenarios, and the Tyranids might win there. However, part of me wishes that a canon-ending could have been adopted, much like in the Star Wars Knights of the Old Republic games, where you could play it where you end up a Sith Lord, but the actual story is supposed to see the Jedi triumph. Perhaps GW don’t want to see the Tyranids defeated, of course, but throughout the series I feel we’re led to believe that the Space Marines will triumph. The Necron thing is still a disappointment, of course. A large part of me still hopes we’ll see a fourth novella in the new year, once we have the new Zarathusa the Ineffable miniature available. Indeed, there is an oblique reference to this chap in Devourer, and I did feel a little cheated when nothing came of it! Time will tell on that, I suppose. There is also the fluff from both campaign supplements that can be read through – as this is intended as a review of the novellas only, I haven’t yet made my way through the bigger books; once I do, I’ll come back and add a post-script or something. I don’t want to end on a low point, though – this campaign is really enjoyable, and worthwhile reading through for anyone who is interested in the setting. The three novellas take various facets of the 40k universe and showcase them to good effect – Blood Angels, Adepta Sororitas, Necrons, Tempestus Scions, etc. Previous Previous post: The Devil Strikes! Next Next post: Horror in the Mountains!